When you close your eyes, you see it clearly: a stained-glass lamp casting a warm glow on the wood and leather armchair, or the Greene and Greene-style sideboard to complement your dining room. Your selection of artwork, personal artifacts, custom lighting and furniture complement each other, show your personal touch, and showcase the time-tested beauty of Greene and Greene-style furnishings, lighting, metalwork, glasswork and other architectural elements. Now, open your eyes. What’s needed? Quarter-sawn oak cabinets? Leaded-glass lighting fixture? Andirons for your fireplace? Jeff Grainger is an artist who knows how to help you achieve a complete Greene and Greene-style design for your home’s custom lighting and furniture. Once you have the vision, you need specific pieces to complete the look. Jeff listens to your ideas and sketches a picture of how he envisions your final piece. With your approval, he begins the process of creating your lighting and furniture using wood, glass, metal or a combination of materials. Jeff’s clients enjoy the insight he brings to each project, often resulting in unexpected details and a truly unique creation you won’t find in any showroom. Jeff is not held to an industrialized step-by-step process that results in the same piece every time. He creates one-of-a-kind furniture by hand, one piece at a time. The process isn’t complete when your new lighting or furniture is built. Jeff also enjoys installing the lighting fixtures and ensuring the furniture fits in your home as planned, fine-tuning any details to make it just right. Jeff Grainger Studio works with architects and interior designers who are looking to create just the right piece to match their exact specifications. Jeff is experienced in working with high-profile clients and welcomes one-off requests. 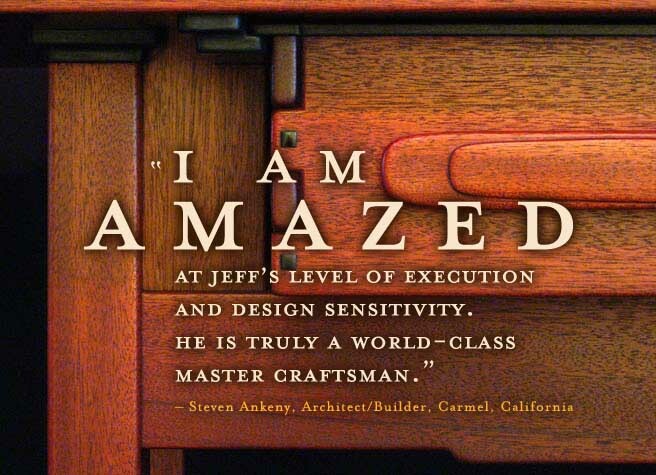 Jeff’s extensive experience will result in a smooth process for you and a truly beautiful piece for your clients. He’ll start designing your custom Arts and Crafts and Greene and Greene-style lighting and furniture to create beautiful objects for your home. © 2017 Jeff Grainger Studio. All rights reserved.